Friday nights football game in Forney was a classic. Terrell built a 21-0 lead only to have to intercept a potential game winning TD pass by Forney with less than 2 minutes to go. Terrell ended up winning 21-15. Cliff has a recap of the game along with quotes from Terrell's Coach Gilbert. 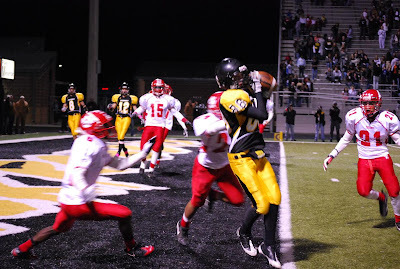 This is the second TD scored by Forney. They came right at me. I will have more game pictures along with Terrell band later today.